If your Library is bloated with RAW files you don’t necessarily need but can’t bring yourself to throw away, RawHide is the compromise you’ve been looking for. RawHide is designed to convert the RAW files you select into high quality JPEG files while preserving your metadata such as comments, ratings, and locations. RawHide will then tag or set the original's rating to reject. RawHide will also process your Photoshop and TIFF images. 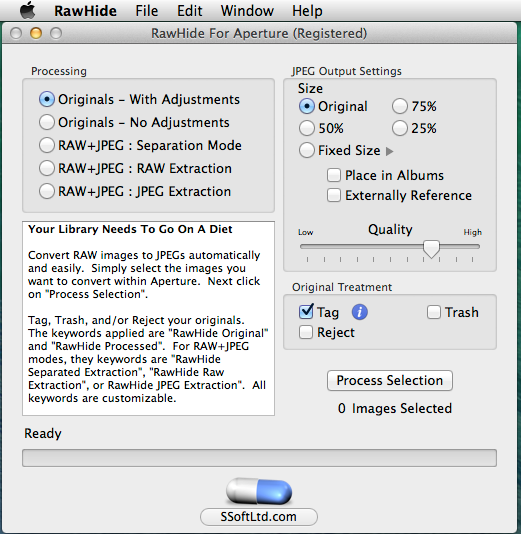 In fact, any image format Aperture can handle will receive the same treatment by RawHide. We can also automatically generate some smart albums that are very appropriate for processing your converted. See this article for further details and instructions. √ Tag, trash and/or reject the original. √ RawHide processed images are placed in the same project as the original. √ Place converted images in the same albums the originals were in. √ Converted images can be located in any folder/disk selected by the user and imported as a referenced file. √ Extract the JPEGs and or RAWs from Aperture's RAW+JPEG storage. √ Additional disk space can be saved by locating converted images on an external disk and importing them into Aperture as referenced files. OS X Snow Leopard (10.6) 64 bit or better. Aperture 3.x and above. The newest version of Aperture (3.6) is also fully tested and supported. Visit the Rawhide For Aperture Support Page. V1.5.11 Better support for more language translations in Aperture. V1.5.10 Bug fixes for various language translations in Aperture. Fixes for RAW+JPEG separation modes that prevent any IPTC export error dialogs being raised. V1.5.7.1 Bug fixes: Validates an export profile used during the conversion process. Removes demo mode restrictions on which Aperture versions can be used. V1.5.6 Improves the quaility of generated JPEGs at every quality setting. This can result in larger JPEG file sizes at your previously choosen setting, so you might want to re-verify if the setting is still appropriate for you. V1.5.4 Bug Fixes: Corrects regression where selected processing option did not take effect. Fix for retina equipped macs for which RawHide generated 2x resolution JPEGs. V1.5 New conversion mode to fixed width/length. Prevents machine from sleeping while conversion is taking place. V1.4.2 √ 3 new modes to separate RAW+JPEG pairs. You can now: 1. Extract both the JPEG and the RAW. 2. Extract just the RAW 3. Extract just the JPEG. √ Customize the keywords applied to the processed images. Now supports OS X 10.6 and above (64bit).